Being part of the global community means that at Etymax we have no shortage of festivals, commemorations and landmarks to celebrate! 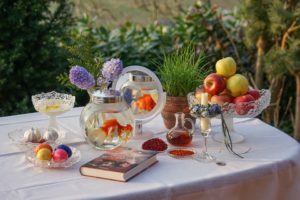 And if the spring equinox, the official end to the winter season, wasn’t enough to look forward to, we have the hope-filled festival of Nowruz that celebrates light and life. Often referred to as the Persian new year, the 3000 year old celebration spreads further than Iran– to Afghanistan, Azerbaijan, India, Iraq, Kazakhstan, Kyrgyzstan, Pakistan, Tajikistan, Turkey, Turkmenistan, Uzbekistan and even parts of China! Nowruz literally means “new day”, which encapsulates the joyful and optimistic outlook of the holiday. When localising content for international markets, understanding the symbolism behind your brand and message is vital to your global success. Etymax offers translation and localisation services that are engaged and in-tune with local cultural concepts. A truly inclusive language service provider, no matter where your words take you.